Meet Adam, and a dazzling array of fascinating and unfamiliar animals from A to Z in this playful alphabet book that retells the story of Adam naming the animals. Beautiful, lush illustrations complement this fun read-aloud. 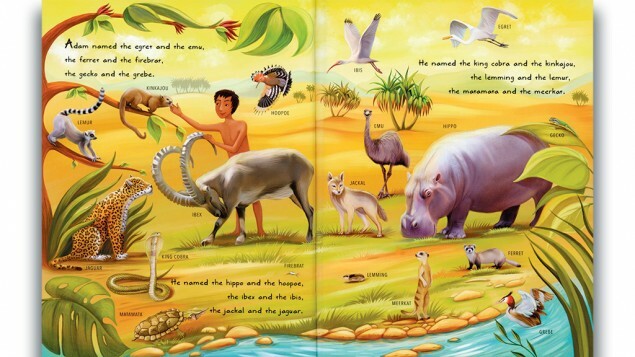 This new picture book builds from one line in Genesis when God decides to have Adam name the animals. The author does a clever job in a situation where content needs to be stretched and most pages consist of many names. His first trick to hold interest through a long alphabetical list is to pair every animal we recognize with a creature we never heard of or barely know. A second tool used is to devote several amusing pages to animal complaints about their names or their sounds. Around these lists the author bookends first a quick but accurate recap of the steps of creation including Adam's and then Eve's arrival. This book embroiders Adam's personality and feelings, but filling in silent Biblical gaps is done by the best of scholars. Eve's arrival is vibrant and imparts the sense of a strong character. The illustrations of the animals are realistic and recognizable. Recommended for ages 4 to 6. Rabbi Barry L. Schwartz is the editor in chief and CEO of the venerable Jewish Publication Society, the nonprofit publisher that produces consistently well-respected, often actively invaluable translations and Torah commentaries, as well as other works of Jewish scholarship. Rabbi Schwartz also is the full-time rabbi of Congregation Adas Emuno, a Reform synagogue that began in Hoboken more than a century ago and now, snug in Leonia, is housed in a charming red-brick building with a lovely, serene, Zen-like garden in the back, always filled with the murmur of little waterfalls, occasionally home to poetry readings. Oh, and he just published a children’s book, Adam’s Animals, with his longtime publisher, Behrman House, through its new children’s imprint, Apples & Honey Press. The book is about to be sent out to the thousands of families in North America and the United Kingdom who subscribe to PJ Library. And exactly how does he do all this? Rabbi Schwartz was ordained at the Hebrew Union College—Jewish Institute of Religion in New York in the mid-1980s. He has been in Leonia for seven years, and he has headed JPS for eight. He began his work with the publisher as a board member, he said, and a rarely quiet, often questioning, occasionally obstreperous board member at that. Although he did not think that such a persona would have endeared him to JPS’s leaders, he was wrong; it led to the job offer, which he accepted with gratitude and excitement. But JPS is in Philadelphia. When he began his work in Leonia, he commuted to Philadelphia every week; the next year he went every month, and by now he goes just once a year. Most of his work is done remotely, he said, and by far more meetings happen in New York than in Philadelphia anyway. Will any of the others be published too? “We’ll see,” he said. “It’s a very simple story, meant for very young readers,” he continued. 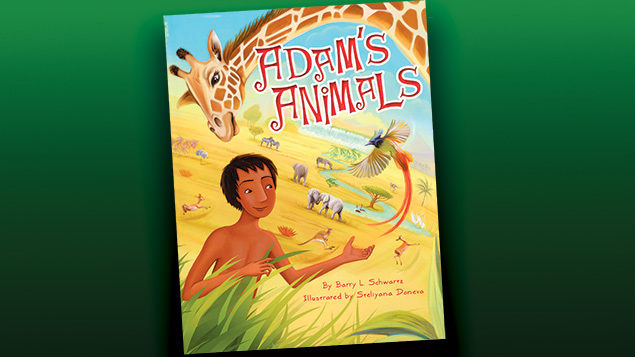 Adam’s Animals tells the story of creation, as told in the first chapter of Genesis. It focuses on Adam’s task—naming the animals. The animals are presented in alphabetical order, a menagerie of fantastical but real beasts. There are lions and tigers and bears; there also are aardvarks and bandicoots and dik-diks and xenopses and xeruses and yaks and yapoks. There’s an unappealing blobfish and a regal jaguar. And at the end, there is a human companion for Adam, a companion who he does not get to name, but who comes with her own name. Adam gets to meet Eve. The illustrator, Steliyana Doneva, has done a wonderful job, Rabbi Schwartz said. He never met her, he added; she is not Jewish, and she lives in Romania. Her English is sketchy at best. But it doesn’t matter. She understands his text completely, he said, and she has brought it to life. “It was so much fun, from beginning to end,” he added. “Doing the research, writing it, all of it. Not that going on safari is an everyday, or even every-year, experience for him, he added. It was instead the culmination of an environmentalist’s lifelong dream. In Adam’s Animals, Adam is not white. That is not accidental. “The story was written to express diversity in many different ways, and in ways that appeal to someone who comes from a different faith background, or no faith background at all. “We are all on this planet together, and we have to figure out how to take better care of it together. “Environmentalism unites us,” he said.